While I have registered for the ATB a few times in the past, I never ran it. This year I did not register before it sold out but got a bib before the transfer date so today I ran my first (and most likely last) Around the Bay 30k today, March 30,2014. It was an uneventful morning, and not a particularly early wake time given the 9:30am start time plus an hour drive. We picked up Carole and Elaine at 8am and were on the way. We made it to the race site with plenty of time to look for a parking space and were lucky enough to scoring an amazing space very close to the venue, right behind a charter bus ... whose driver was nice enough to let me use the bathroom so I didn't even have to deal with port-o-let lines! Bonus! We slowly made it to the start line, not in much of a hurry as Elaine and Carole are relaxed runners and I was not "racing" today, I was just out for my long training run for Boston. We finally caught up to the massive group and this is where I saw something that hit me as a bit of a problem. Way up, hundreds of people in front of me, the only pace bunny sign I could see read 3:30! OMG - 3:30????? Then I turned around and realized there were probably only 100 or so folks behind me. So, 13,000 registered ... running at my "training pace" of 5:30/km (estimated 2:45 finish) I was not in the most ideal position. Deep breath, this is not a race, it is training, it is all good. 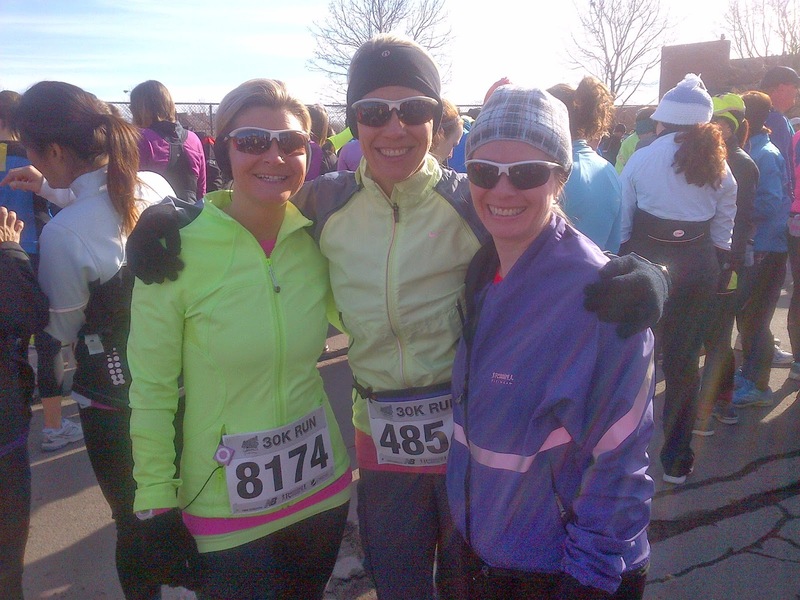 Carole, me and Elaine at the back of the starting pack! The gun went off and it took me 10 minutes to get to the start line! 10 minutes! Ok, not a problem, this is just a training run. So I ran, I weaved, I passed and passed and passed. The weather, while it threaten to be cold and windy, was pretty darn nice for March 30! By kilometre 3, I was taking the sleeves off my wind breaker. From then out I felt perfectly dressed in my tights and light long sleeved shirt. I have to say the weather probably couldn't have been better for a late March day! So here's this race in a nutshell. 20 kilometres of boring, ugly, smelly industrial running. Then 10 km of beautiful homes and rolling hills with some massive climbs ending around kilometre 27 and then a down hill run to the finish. I felt horrible. I cannot remember feeling so horrible after a race. I stopped at medical and sat down on a chair but quickly stood up. Sitting was not the right thing to do. I staggered to the medals and found my way to the plastic bag that had a banana and a bag of candy. My legs were wobbly and I was searching for a place to lean when I saw Cavin walking toward me. A huge wave of relief washed over me. I did not want to be alone in a sea of people. Shawna, Calvin's lovely fiancée took my stuff (I had my hand-held bottle, the steal bottle they hand out at the finish line and my food baggie. I inhaled my banana thinking it would somehow cure my pains. I'm not sure how long we stood there but I slowly stretched and regained my balance and composure. They were off to the beer tent and I made my way back to the finish line to wait for Barry. Unlike after the Midsummer's Night 30k, today I felt great - like it was just any other training run I've ever done. So my running has definitely improved in the couple of years! So happy to see Barry in the stands and happy to feel great. I executed this race pretty well except for starting so far back and having to run through people for the entire 30k. I nailed my nutrition and adapted my eating schedule according to the water stations. I felt great the entire run and feel pretty good now. I'm feeling positive going into Boston in 3 weeks - I'm not sure what my goal is going to be but I would be happy to run between 5:20 and 5:30/km. I have to keep in mind that I still have Ironman training on the schedule for the next three weeks as well! Will I run ATM30k again - probably not - unless the weather was going to absolutely awesome and I had an early season Marathon (like Boston) to run. However, it is worth noting, that while this is a HUGE race, it is run pretty well. The water stations (while not necessary spaced as I like) were well staffed and the volunteers as always were amazing (Please remember to say THANK YOU to the volunteers on the course- I didn't hear nearly enough of that today). The finish line is very efficient and well run with a good assortment of food and they do a good job of getting you through the finish area without feeling rushed. A+ to the race director and his team! And always, a big Thank You to my number one fan for driving us to Hamilton and being photographer and finish line sherpa! Thanks Barry!